Twelve teams from seven countries spent two days scrimmaging, tackling, and running under a benevolently gentle Caribbean sun. Undoubtedly on the woman’s side there was no one to set a torch to The Dog River Howlers who beat the Cuban National Women’s team 29-0 in the final. On the men’s side the two teams from Trinidad and Tobago, Rainbow SCC and T&T Enthusiast Rugby Football Club (TTERFC), were both formidable. Indeed one of the semi-finals was an all-Trinidadian affair, which TTERFC won 10-5 before going on to defeat the Dog River Howlers men’s team and defending champions 41-5 in the final. The Dog River Howlers are an invitational rugby club founded by Karl Fix in early 2007 for the lovers of ‘our game’. The club is based in Dog River, Saskatchewan, Canada. The Howlers are made up of players and supporters from all parts of Canada, as well as a few from other countries, who believe that ‘rugby is more than a game, but a way of life’. The club tours to interesting parts of the world, plays rugby and enjoys unique cultural experiences, while also giving something back to that country’s sport and/or people. The Howlers also raise funds and contribute to worthwhile endeavors, which are not related to rugby. The Howlers use ‘our game’ as a vehicle to build bridges between people around the world. ‘I saw the passion that they [the Cubans] had for the game. There are great, great athletes, but they just had no support. You can’t play without balls, you can’t develop a game without balls and jerseys and boots and people to teach what they know. I saw that they are very genuinely passionate about life and about the game. They just needed a bit of a helping hand. When our players go down there and they say they’re with the Dog River Howlers, they’re held in very high esteem. 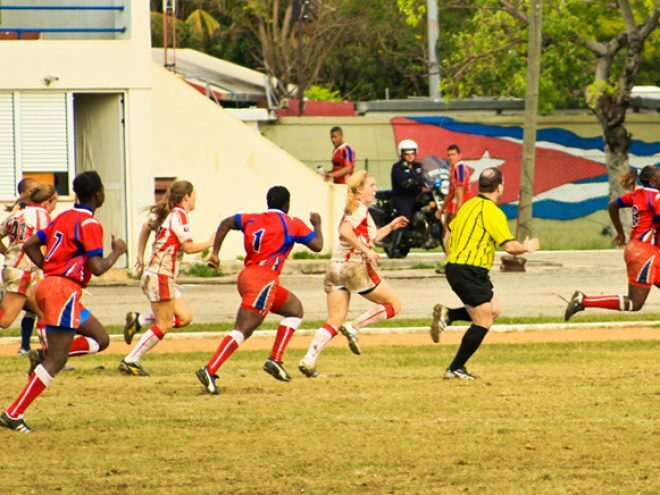 One reason is because we’re a good team and we’ve done really well down there – usually winning or coming in second – but the rugby community realizes that without the Howlers, Cuban rugby wouldn’t be where it is today … They realize the impact that Canadians – Canada and the Howlers – have had on their game.